My interview with Sister Marie Augusta Neal took place in 1998 on a rainy afternoon in a quiet kitchen in Lowell, Massachusetts. Her spirit and what she achieved lit the room brightly. 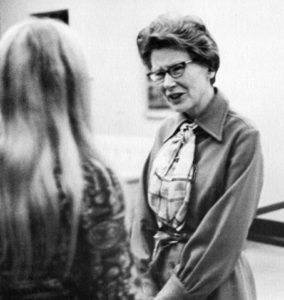 I have interviewed many extraordinary people over the years and been ehttp://library.emmanuel.edu/Archive/content/sr-marie-augusta-neal-snd-professor-sociology-1969-1970nriched by their stories. Sr. Marie Augusta Neal is certainly at or near the top. One story she told me that was not included in the final publication was about her invitation to South Africa after she published the Sisters Survey described below. The white Sisters there – all white at the time – were caught between the apartheid system (1948 to 1994) ‘ in which they worked and their own sense of justice. They walked out of the white schools where they had taught for generations and opened new schools in the black neighborhoods. Often that also meant walking away from their families. It was an important step to end apartheid. Often, teaching is a tool for learning. So it has been for Sister Marie Augusta Neal. Sister Marie Augusta Neal entered the Sisters of Notre Dame in 1943, the year after she graduated from Emmanuel College. Ten years later, she took her perpetual vows. After a brief period of teaching in South Boston and Lawrence, she was encouraged to continue her education. From Boston College, she went to Harvard where she earned a doctorate in Sociology. By the 1960’s, with the Vatican Council being called, the values of the Church began to evolve towards a more participatory structure, recognizing people’s right to participate in the decisions that effect them. This was very much in keeping with Sister Marie Augusta’s studies. The CMSW board accepted the study as Sister Marie Augusta proposed it with one major change. Rather than a random sample, they asked that she undertake a survey of the entire population of 157,000 Sisters. She did so. The result was The Sisters Survey, the first comprehensive study of the attitudes of Catholic Sisters ever done. Over 90% of the Sisters contacted responded, each answering hundreds of questions. Forty Sisters who were also sociologists were organized to each take responsibility for 5,000 of the questionnaires. The questionnaires were distributed in December, 1966 and a report analyzing the responses was ready by the summer of 1967. The knowledge of who you are offers the chance to decide who you will become. This was the value of The Sisters Survey to the congregations of women religious. Sister Marie Augusta sees change as an ongoing process. She describes the evolution of Sisters’ roles as “vows without walls”. While the cloister may have been removed, the commitment remains very much alive.